I've heard a lot of inspiring stories of self-healing benefits by healthy juicing. During our trips in various organic farms, the farmers themselves stressed the importance of treating food as a medicine. Thus, the advent of healthy juicing using various techniques from the old-school of squeezing fruits to the use of sophisticated slow juicers became more easily acceptable by many people. People have been juicing fruits for ages. Pick the fruit, squeeze it, and drink. Today, it's easier and more convenient with the help of products that maintains the flavor and enzyme of our food. 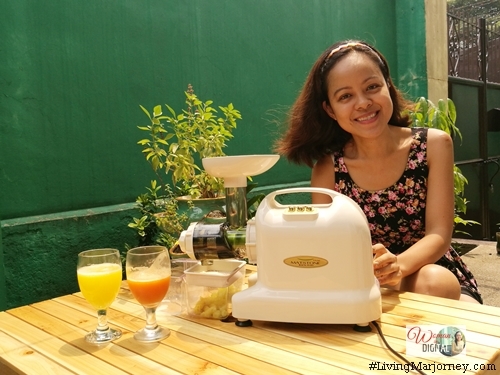 I've been using Matsone Low Speed Multi-Purpose Juicer for a couple of days now. 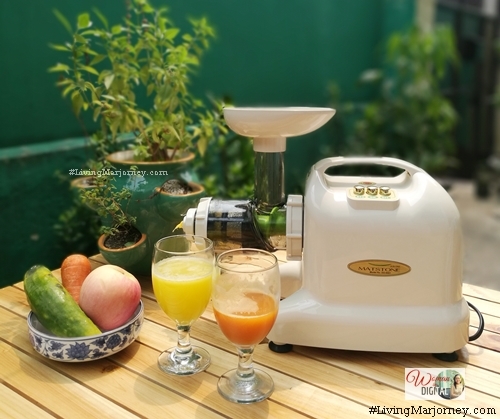 Matstone is not just an ordinary slow juicer, it's a multi-purpose juice extractor which means you can use it in preparing variety of food from mincing vegetables and fruits. Matstone grind fruits and vegetables and gently presses and squeezes them so the flavors and nutrients of the fruits are maintained as they are. Fruits and vegetables contains essential nutrients we need everyday, with juicing, the liquid is absorbed in the body much faster. It can also be used for making oils just like the Misso S20 Seed-to-oil wonder extractor. It is known that fresh fruits and vegetables contains natural vitamins, minerals and diverse enzyme. Best of all, they help prevent and even fight cancers. Fruits and vegetables are also good source of antioxidant and helps prevent early aging, also takes care of our skin. Here's a delicious and healthy Pineapple Cucumber Juice that prevents Kidney and Digestive problems. Cucumber helps in the treatment of edema and enhancement of renal function. While pineapple aids in digestion and improves constipation. The series of organic farm familiarization tours we had for the past six years was an eye opening. At Rapha Valley farm in Don Salvador Benedicto in Negros Occidental made me realized how important every food we eat. I used to think food are just for nourishment. It helps to know food also work as a medicine that fights certain diseases like cancer. Matstone Multi-purpose Juicer can also make sorbet, can be used for grinding coffee, mincing, slicing and extract oils.